We are your one stop for projector screen rentals! You can’t use a projector with something for it to project onto. Unless you are a fan of your projected image looking like drywall, get a projector screen rental. No matter what size of projector screen you need, our agents can help you get the best screen size to fit your environment. We can even supply movie-style projection screens for large venues. Even if you already have a projector screen, projector screens can be more than a nuisance to transport, as they take up large amounts of space even when rolled up. If you rent a projector screen from us, we can do an on-site delivery to spare you from frustration and possible damage to personal belongings which could occur from transporting the projector screen yourself. If you find yourself lacking space in which you can place your projector, you can always rent a rear projection screen. Having a rear projection screen cuts down on the space needed to place the projector by allowing you to project onto the back of the screen instead of in front of the screen. You don’t want your screen to look out of place, or be taller than the walls of the room. Knowing the height of your venue’s ceiling will allow you to determine the appropriate screen size. If none of your audience members can see your presentation clearly, there’s no point in having a projector. 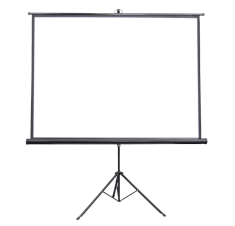 When renting a projector screen, consider the distance from the screen to the audience. Viewers that are the farthest away from your screen should determine your minimum screen width. A good general rule is to have your screen be at least as wide as ⅙ of the distance between the presenting screen/wall and the farthest viewer. Knowing your projectors native resolution allows you to know which aspect ratio you will need in order for your screen to perform at maximum effectiveness. Knowing these three things before speaking with one of our agents will make renting the projector screen you need quick and easy. With almost 30 years in the projector rental industry, the agents at RentOurProjectors.com have the experience and knowledge to handle your projector screen rental needs from start to finish. Our customer service and reliability is what sets us apart from the other rental companies.